Perhaps it’s not difficult to believe that God is willing to forgive us the first time we sin, especially if we learn from those mistakes and vow never to commit that same sin again. But what about after we have repented—after we have promised never to repeat that sin (that lie, that lust, that frivolous purchase, that situation we keep putting ourselves in, or that addiction we swore off)—and instead of learning from our mistakes, we go and do them again… and again … and again? Will God forgive us after so many repeat offenses? The question is a good one. After all, I am a Christian. I have a new life in Christ, but I seem to have the same sinful nature. Before giving my life to Christ, I wasn’t bothered by sin in my life. I was hardly aware of it. To me, I was as good as everyone else and better than some. Now, I am aware of my sin all the time. I get so disappointed in my failure to think and act like Jesus. The Apostle Paul wrestles with this in Romans 7:14-25 We know that the law is spiritual, but I am unspiritual, sold as a slave to sin. I do not understand what I do. For what I want do I do not do, but what I hate I do. And if I do what I do not want to do, I agree that the Law is good. As it is, it is no longer I myself who do it, but it is sin living in me. I know that nothing good lives in me, that is, in my sinful nature. For I have the desire to do what is good, but I cannot carry it out. For what I do is not the good I want to do; no, the evil I do not want to do—this I keep on doing. Now if I do what I do not want to do, it is no longer I who do it, but it is sin living in me that does it. So I find this law at work: When I want to do good, evil is right there with me. For in my inner being, I delight in God’s law; but I see another law in the members of my body, waging war against the law of my mind and making me a prisoner to the law of sin at work within my members. What a wretched man I am! Who will rescue me from this body of death? Thanks be to God—through Jesus Christ our Lord! So then, I myself in my mind am a slave to God’s law, but in the sinful nature a slave to the law of sin. In a tongue-twisting torrent of words, Paul lays out our problem as he looks at his life as a Christian. He acknowledges that he daily has the opportunity to do good in the eyes of God. In fact, he wants to do good in the eyes of God, because he is thankful that God brought him to believe in Jesus as his Savior. But in shame, the Apostle makes this startling remark, “I do not understand what I do. For what I want to do I do not do, but what I hate I do”. Paul is confessing that many times he is confronted with circumstances where he knows exactly what the right, God-pleasing, thing to say or do would be – but then, he’s disappointed when he does something different than what he wanted to do or says something other than what he wanted to say. Worse yet, this scenario plays itself over and over again in his life, and he hates it. In fact, Paul says he’s even more disappointed when the situations arise where he can see the harmful effects that wrong actions would bring on his life, but he does them anyway. It’s like a drug addict, who knows that another puff, drink, or injection will only further destroy him, but he gets high anyway. Because Paul recognizes that these sinful actions will be harmful, he agrees that God’s law is good and right, because the Law is put in place to keep him from hurt and pain. Since these sinful actions run contrary to his new spiritual nature, he pinpoints the cause of the problem when he says, “I know that nothing good lives in me, that is, in my sinful nature. For I have the desire to do what is good, but I cannot carry it out”. Since it is his sin that is causing him all these problems, even as a Christian, then it also follows that Paul is in need of forgiveness, even as a Christian. Since sin is first and foremost a crime against God, then it follows that the Apostle Paul is in desperate need of forgiveness that only God can offer. Who of us is any different? We, too, must admit that we are daily guilty of sin. Even when we know better, even when we want to do better, we sin. That’s an important reminder for us, especially as Christians, because it keeps us from becoming self-righteous, filled with arrogant pride about our goodness (which is also sin). Since as Christians we are still sinners, we are still in need of a Savior and the forgiveness that only God can offer us. Before we can really understand God’s forgiveness, we must understand our own sinfulness, even as Christians. As we look for God’s forgiveness in answer to our sinfulness, it’s imperative to remember this universal truth: namely, that there is nothing we have done—nor that we can do—to earn God’s forgiveness. As we grow to understand our ongoing need for God’s forgiveness, we will also grow in our understanding of who we are as Christians. The Apostle Paul tells us very plainly that we are schizophrenic. He tells us that Christians really have two natures living within them. They are both saint and sinner simultaneously. They are saints, because God, in His mercy, has brought them to faith in Jesus Christ and put His Holy Spirit in them. He has set them apart for His divine purpose. Paul refers to the Holy Spirit as his new nature (inner being) and He causes Paul to delight in God’s law. But he also concedes that there is another spirit still at work inside of him, the nature he was born with, the one that is hostile to God, the law of sin that is capable of wickedness. It is a rebellious spirit that wants to be god and regard everyone else as less important. Paul isn’t making excuses for sin by describing the dual nature of a Christian. According to the nature of the Holy Spirit, Christians hate sin. But at the same time, a Christian’s sin nature still manifests itself in his thoughts, words, and actions. These two natures are in constant conflict with one another. Neither wants the other to survive. It’s a fight to the finish for control over our souls. As long as we’re alive, that fight will continue. If we’re no longer bothered by the fact that we continue to sin, then our sinful nature has won and we are no longer walking by the Holy Spirit. But so long as the battle continues, and the Spirit of God is at war inside of us against our sinful nature, then we can be assured that God’s forgiveness is ours. As long as we are in the battle, we are not captives of the enemy. God is still working on us and through us, conforming us to the image of Christ. After seeing the truth about Himself, the Holy Spirit strengthened Paul, the new man of faith, with the truth about righteousness. Paul writes: Romans 3:22-24, “This righteousness from God comes through faith in Jesus Christ, to all who believe. There is no difference, for all have sinned and fall short of the glory of God, and are justified freely by his grace through the redemption that came by Christ Jesus”. Regarding this grace, and God’s ongoing forgiveness, and his certainty of salvation, Paul writes Ephesians 2:8-9, “For it is by grace you have been saved, through faith--and this not from yourselves, it is the gift of God--not by works, so that no one can boast.”. It’s these precious gospel truths that cause the Apostle Paul to spring forth in joy in answer to his own question, Who will save me from this body of death?” when he responds, “Thanks be to God--through Jesus Christ our Lord! So then, I myself in my mind am a slave to God's law, but in the sinful nature a slave to the law of sin.” Thanks be to God – because of His love, He forgave our sin through the atoning blood of his Son, Jesus Christ. It is finished! We are forgiven! We are no longer condemned to Hell and damnation! Now, the Holy Spirit is conforming us to the image of Jesus and preparing us to be the Bride of Christ upon His return. However, this fact of our forgiveness doesn’t keep Satan from attacking us, tempting us, nor from accusing us. Satan wants to convince us that there’s no hope – that God couldn’t possibly forgive us for all of the awful things we’ve done, that Jesus’ Blood is not powerful enough, not sufficient enough, to cover all our sin. He wants us to believe that since we keep sinning, it is proof we are not saved. We aren’t going to make it; therefore, we might as well go ahead and satisfy every sinful desire. The truth is—there is no hope for Satan! Rev 12:10 Then I heard a loud voice in heaven say: "Now have come the salvation and the power and the kingdom of our God, and the authority of his Christ. For the accuser of our brothers, who accuses them before our God day and night, has been hurled down. That’s why we give thanks that the Holy Spirit gives us power to fight the temptations of the devil and the inclinations of our sinful nature. The Holy Spirit reminds us of the eternal consequences of sin through the preaching of God’s law. Then in His grace, He continually raises up the new man of faith, who is strengthened through that universal, timeless gospel truth – that the blood of Jesus Christ, cleanses us from all our sin! So when we are troubled by the question, “Does God forgive me when I keep on sinning?” understand this about God’s forgiveness: He gives it to us with no strings attached, because He loves us. The atonement for our sin, that makes us right with God, is based on what Jesus has done for us, not anything we have done or not done. Thanks be to God, for He has rescued us from these bodies of death so that we will live with Him eternally with a new, glorified body! In the meantime, we don’t have to accept Satan’s temptations nor his condemnation. We can battle our accuser the same way Jesus did—with the Word of God, prayer, and the power of the Holy Spirit, who teaches us to defend ourselves against accusations, criticisms, and insinuations of guilt and worthlessness. Paul continued writing in Romans 8, explaining our deliverance and salvation. With these Scriptures and prayer, we can resist condemnation. 1. Our first defense is the truth found in Romans 8:1-2 "There is no condemnation for those who are in Christ Jesus because through Christ Jesus the law of the Spirit of life set me free from the law of sin and death." Memorize these verses. Ask the Lord to give you faith to know the assurance of your blameless status before God through the complete work of Christ’s forgiveness, redemption, and atonement on the Cross. 2. What our fleshly efforts could not accomplish in fulfilling the demands of the law, we overcome by the Holy Spirit, who gives us power to subdue our sinful nature. Romans 8:3-4 "For what the law was powerless to do in that it was weakened by the sinful nature, God did by condemning sin in sinful man in order that the righteous requirements of the law might be fully met in us, who do not live according to the sinful nature but according to the Spirit." If you feel powerless against the flesh and devil, ask the Lord fill you with His Spirit so you can overcome anger, jealousy, bitterness, anxiety, fear, lust, shame, guilt, and all fleshly struggles. 3. The use of sense and reason, without the controlling power of the Spirit, is a futile way to try to conquer temptation and evil. Romans 8:5-9 "Those who live according to the sinful nature have their minds set on what that nature desires; but those who live in accordance with the Spirit have their minds set on what the Spirit desires. The mind of sinful man is death, but the mind controlled by the Spirit is life and peace; the sinful mind is hostile to God. It does not submit to God's law, nor can it do so. Those controlled by the sinful nature cannot please God. You, however, are controlled not by the sinful nature but by the Spirit, if the Spirit of God lives in you. And if anyone does not have the Spirit of Christ, he does not belong to Christ." Ask the Lord to help you focus on the Holy Spirit, instead of your fleshy desires and the devil’s temptations, so you can please God instead of yourself and the devil. 4. Remember who you are in Christ Jesus. You are a son of God and you have been given the righteousness of Christ. Remind the devil of it, too, when he tries to condemn you. Romans 8:10-15 "But if Christ is in you, your body is dead because of sin, yet your spirit is alive because of righteousness. And if the Spirit of him who raised Jesus from the dead is living in you, he who raised Christ from the dead will also give life to your mortal bodies through his Spirit, who lives in you. Therefore, brothers, we have an obligation--but it is not to the sinful nature, to live according to it. For if you live according to the sinful nature, you will die; but if by the Spirit you put to death the misdeeds of the body, you will live, because those who are led by the Spirit of God are sons of God. For you did not receive a spirit that makes you a slave again to fear, but you received the Spirit of sonship." We are sons of God, coheirs with Christ, and ambassadors of Jesus Christ. Remembering who we are and God’s purpose for our life will help us to daily follow Jesus, die to self, pick up our cross, and walk by the Spirit. Ask the Lord to give you a greater realization of all the rich resources imputed to you through the righteousness of Christ. 5. Pray when you are feeling weak, fearful, or inadequate. Romans 8:26-27 "In the same way, the spirit helps us in our weakness. We do not know what we ought to pray for, but the Spirit himself intercedes for us with groans that words cannot express. The Spirit intercedes for the saints in accordance with God’s will." Pray for yourself and ask the Lord to encourage others with the assurance that the Holy Spirit is able to intercede, deliver, and support us during any difficulty with Christ’s all sufficient grace. 6. Remember God’s promises. God can turn adversity into something great! Ask the Lord to help you trust Him and obey Him so He can work His sovereign wonders in bringing all things together for good for you and for others who love God and are obedient to His will. 7. Remember God is transforming us into the image of Christ. As we go through trials, we are becoming mature in the Lord. Our purpose is to reflect His light; that is, the attitude, actions, and character qualities of Jesus, which glorifies God. Romans 8:29-30 "For those God foreknew he also predestined to be conformed to the likeness of his son, that he might be the firstborn among many brothers. Those he predestined, he also called; those he called, he also justified; those he justified, he also glorified." 8. Remember God is for us. He will give us everything we need to do His will. Apart from the Holy Spirit, we cannot do anything. With Him, we cannot fail. We can do anything God wants us to do. And Jesus is interceding for us. We are not defenseless against the devil. Romans 8:31-34 "What, then, shall we say in response to this? If God is for us, who can be against us? He who did not spare his own Son, but gave him up for us all--how will he not also, along with him, graciously give us all things? Who will bring any charge against those whom God has chosen? It is God who justifies. Who is he that condemns? Christ Jesus, who died--more than that, who was raised to life--is at the right hand of God and is also interceding for us." 9. Remember the devil cannot separate us from the love of God—regardless of any evil he brings upon us—even death. Romans 8:35-39 "Nothing will be able to separate you from the love of Christ, including suffering, affliction, tribulation, calamity, distress, persecution, hunger, poverty, peril or sword. You are more than conquerors through him who loved us. For I am convinced that neither death nor life, neither angels nor demons, neither the present nor the future, nor any power neither height nor depth, nor anything else in all creation, will be able to separate us from the love of God that is in Christ Jesus our Lord." By the grace of God and the power of the Holy Spirit, we will persevere and overcome. We will conquer the temptations and strongholds of the enemy in our lives. Ask God to help you share the blessings of intimacy with Christ’s power, truth, wisdom, sufficiency, and inseparable love. If you don’t know Jesus Christ as your savior, I’m sorry, you are still condemned. However, you can change that by accepting Jesus’ atonement for your sin on the Cross and making Him your Lord. Give your life to Him by repenting of your sin and dying to self in baptism. He will give you a new life born of the Holy Spirit. 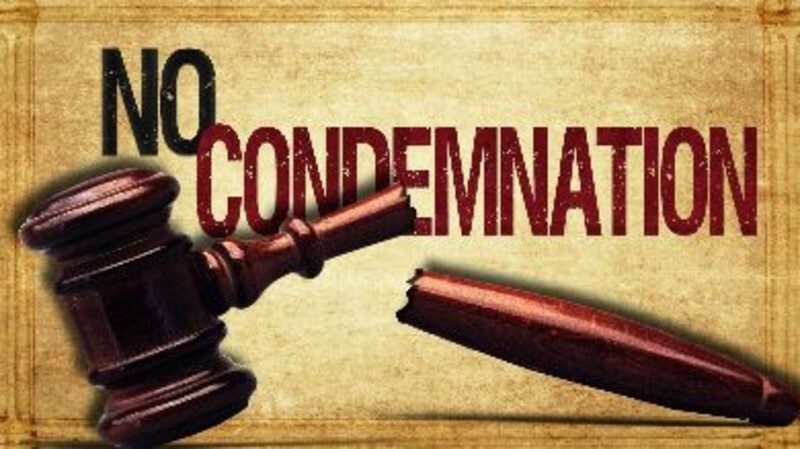 Then, for you, there will be no condemnation any longer.